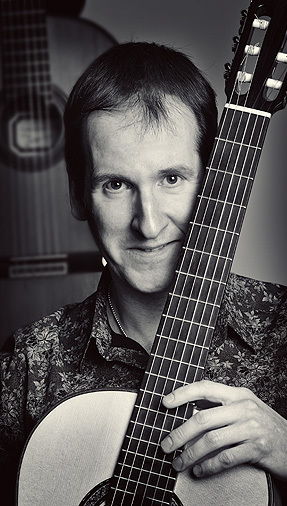 I studied classical guitar at the London College of Music for four years with Douglas Rogers and Carlos Bonell. My musical training continued whilst taking master courses throughout Europe, run by leading guitarists including David Russell and Vladimir Mikulka. In 1990 I won the coveted Guitar International Magazine ‘International Sanchis Guitar Competition’. I have performed at over a thousand functions including weddings, anniversaries, birthday parties, private functions, product launches and corporate events. I play many different styles including classical, film, TV and musical, Latin American, jazz and swing, blues, boogie-woogies, ragtime, flamenco and contemporary. This wide diversity of styles helps to ensure that if required, I am able to play throughout your wedding day, from the pre-ceremony, ceremony, drinks reception and wedding breakfast, changing the music and tempo to suit the mood. I pride myself on being reliable, versatile and amiable and promise to delight both audiences and clients alike.